Be sure to mark this amazing event on your calendar as the Grand Rapids Symphony honors the accomplishments of individuals and organizations that celebrate the importance of diversity, inclusion and bridge-building in West Michigan with the MaLinda P. Sapp Awards, and entertains guests with a fabulous concert featuring Black Violin! ♦ Isaac V. Norris + Associates, P.C. Both Celebration of Soul as well as a portion of the Symphony with Soul ticket revenue benefits the Grand Rapids Symphony’s extensive Gateway to Music education and access programs which reaches over 75,000 West Michigan students in urban, rural and suburban school districts. Among those programs, the Grand Rapids Symphony’s Mosaic Scholarship Program benefits 20 African American and Hispanic students. Each Mosaic scholar receives instrument rental, private instrument lessons from a professional musician and season tickets to the Symphony’s Richard and Helen DeVos Classical Series. Gala tickets are $150. For more information on the Celebration of Soul Gala, or to purchase tickets over the phone, please call 616.454.9451 x 165. To order Symphony with Soul tickets featuring Black Violin only, please call 616.454.9541 x4 or click HERE. The Grand Rapids Symphony Community Chorus is looking for members to join us for Symphony with Soul 2019! For more information about the chorus, please email Julie Nystedt at jnystedt@grsymphony.org, including your name, address, and your interest in the Community Gospel Chorus. 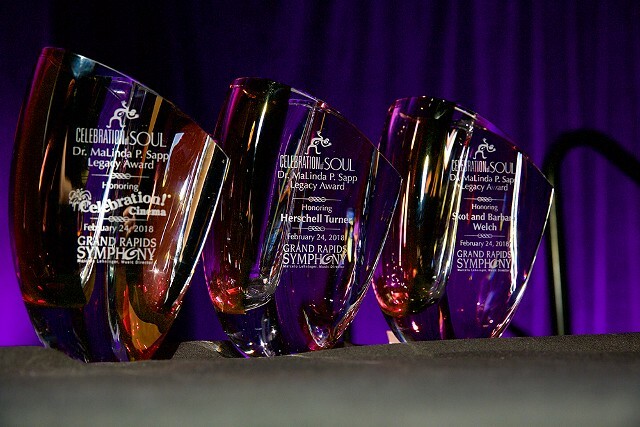 In 2006, the Grand Rapids Symphony created Celebration of Soul, an event to honor the accomplishments of individuals and organizations that celebrate the importance of diversity, inclusion and bridge-building in West Michigan. The Grand Rapids Symphony’s commitment to establishing a diverse community reverberates in all the orchestra’s programs and services. This is reflected in the selection of diverse guest artists and conductors who embrace diversity, Symphony musicians who donate their time, as well as Symphony music education programs that serve schools in which arts education is a fraction of the curriculum. As part of Celebration of Soul, the Dr. MaLinda P. Sapp Legacy Award was established to honor individuals and organizations for their on-going diversity efforts and accomplishments. The award celebrates an organization or person's distinguished leadership and on-going commitment to advancing engagement, inclusion and diversity. A recipient is a leader that successfully models diversity and inclusion in their profession or industry. They are inspirational, consistent and innovative and encourage others to be culturally competent. The Dr. MaLinda P. Sapp Legacy Award gives the community the opportunity to recognize honorees for their commitment to diversity, education, and bridging cultural differences.